This is a nice recipe, it is not only easy to prepare but has also a nice presentation. 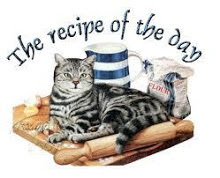 It is a typical recipe in France, and it is always successful! Prepare the stuffing: in a large bowl, bring together some crumbled bread and the milk. Add mixed herbs, salt and pepper, the chopped onion and the egg. Crumble the meat and mix. Cut the top of the potatoes, then remove the tomato pulp with a teaspoon (careful not to pierce the bottom of the tomato). Put the pulp in the sauce pan you will use, it will make a sauce. 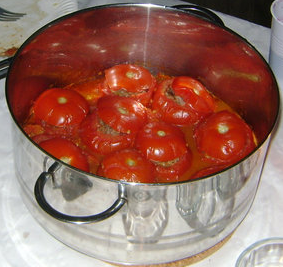 Stuff the tomatoes with the meat, put the top back and place them in the saucepan. Add some water (in the saucepan, but not directly on the tomatoes) so that t won’t burn (you can also add some more water anytime during the cooking process if necessary). Put some salt on the tomatoes. You can also put some paprika in the water to colour it! Cover and cook for about 30 min. Check regularly to prevent the dish from burning. To serve with the dish, you can also stuff potatoes the same way. In that case, count 1 tomato and 1 potato per person. Or you can serve it with rice. In that case, make sure there is water in the saucepan, so you can have a sauce for the rice.